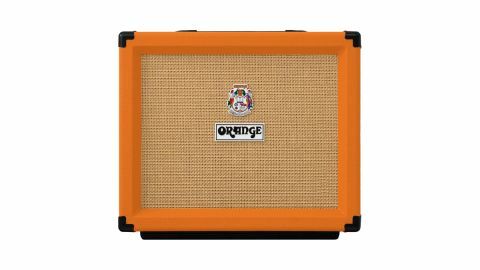 The Orange amps recipe traditionally mixed a big heavy head and 4x12 cab - the former powered by that British staple, the EL34 valve (which was also widely used by Marshall and Hiwatt) - but these days there’s a slightly lighter side to the Orange catalogue. Back in the late 90s came the AD30R - a combo that used EL84s (a valve synonymous with Vox and other classic British combos), and soon came to be regarded as the reborn Orange’s first modern classic. Ever since then, the EL84 has become part of the Orange sound - especially since the coming of the world-beating Tiny Terror head - so we’re expecting great things from Orange’s latest, the dual EL84-powered Rocker 15 combo. A re-work of the 2006 Rocker 30, the Rocker 15 is a nicely-proportioned 1x10 combo sporting classic Orange styling, right down to the wooden skids that Orange uses instead of rubber feet. These actually couple better to wooden stages and enhance projection and bottom end. The electronics are also typical Orange; out-sized transformers on a powder-coated steel chassis enclosing two heavy-duty printed circuit boards. The larger main board holds almost everything including the valve bases and front panel controls, with a smaller board for the rear panel sockets. Externally, the control panel has the classic ‘pics only’ layout, which looks as cool today as it did back in the 1970s. The Rocker 15 is a two-channel design, with a drive channel including gain, master and three band EQ controls. The clean channel, which Orange calls ‘Natural’, just has a single volume control. The Rocker 15 could be a great weekend warrior tool, portable and compact enough to fit on pub stages. Other features include a full/half-power mode incorporated in the standby switch, a rear panel attenuator labelled bedroom/headroom, which drops the output down to around one watt, and a series effects loop. In use, it powers up nice and smooth, with very little hum and hiss. The Dirty channel has a wide gain range that covers classic and modern Orange tones with ease, going from a square, mildly driven sound that’s perfect for authentic early 70s pop and rock, up to the ‘blanket of filth’ distortion that’s a staple for many heavier bands, with nice passive EQ controls that let you precisely dial in the right midrange to suit any guitar. The Rocker 15’s Natural channel is a real revelation, with sparkling clarity at lower volume levels moving to a thicker more ‘pushed’ tone that’s ideal for rhythm. It seems to suit any guitar equally well; we tried the Rocker 15 out with a variety of different instruments and whatever we plugged in, the Natural channel seemed to find a balance that let the guitar breathe and respond despite the lack of tone controls, with the ideal volume level around the halfway mark. The half power and attenuator switches work together to get the amp cooking at volume levels from bedroom to small gigs; and combined with the Rocker 15’s low noise levels, this makes Orange’s latest a perfect recording partner. The other studio asset is the Rocker 15’s 10-inch custom design loudspeaker. A 10-inch speaker tends to ‘pre-EQ’ a guitar’s overall sound, removing some of the lows that are often dialled out in the studio to give the guitar its place in a finished mix. The same thing applies for live use, and the Rocker 15 could be a great weekend warrior tool, portable and compact enough to fit on pub stages, where space is usually hard to come by, without sacrificing too much in overall volume and clarity. At full power, the Rocker 15 is loud - 15 valve watts is enough to see off many 50-watt solid state amps, so don’t let the numbers fool you, this compact combo is easily powerful enough to handle most small gigs. Brit brands have great pedigree with small combos, and Orange’s new Rocker 15 ticks all the right boxes to continue this trend; it’s built to a very high standard, looks great (as long as you don’t hate orange!) and has a strong, if not overly versatile range of tones that will handle a variety of classic genres. It’s also very keenly priced, thanks to offshore manufacturing in Orange’s own facility.